Campus Lounge dressings include parmesan caesar, buttermilk ranch, smoked bleu cheese, agave-raspberry vinaigrette, Meyer lemon mustard, chile Lime and vinegar and oil. Add Red Bird grilled chicken breast or Atlantic salmon. All burgers are served on a Harvest Moon Challah bun, or substitute a Victoria's GF Bun. Or, make it vegetarian with the Impossible Burger. A traditional cheeseburger with your choice of American, Wisconsin cheddar, ghost pepper jack, provolone, smoked bleu cheese or Swiss, served with our homemade pickles. Topped with aged Wisconsin cheddar, crispy natural hickory smoked bacon, onion rings and BBQ sauce. Presented with our guacamole and Pueblo green chili mayo, ghost pepper jack cheese and a chile lime super slaw. Savory Black Angus ground chuck patty smothered in your choice of red or green chili, topped with shredded cheddar jack cheese and diced red onions and tomatoes, served open-faced with french fries. Spiced Red Bird chicken sausage patties served on a sweet bun with a pineapple habanero jam and a fresh herb salad. All sandwiches come with your choice of side. Substitute for a Victoria's GF Bun. All natural applewood smoked turkey breast, hickory smoked bacon, Swiss cheese, lettuce, tomato and mayo on Texas toast. Seasoned grilled Red Bird chicken topped with hickory smoked bacon, ghost pepper jack, lettuce, tomato, and Pueblo green chili mayo served on a Harvest Moon challah bun. Three Nathan’s Famous all beef hot dogs smothered with our homemade red chili and topped with cheddar jack cheese and diced red onions. Premium shaved sirloin, sautéed bell peppers and onions with beer cheese and provolone. Large flour tortilla with your choice of grilled Red Bird chicken breast, house chicken chorizo, seasoned beef or carnitas pork. Served with borracho beans, spicy rice, pico de gallo, guacamole and sour cream. Smothered in green chili and cheddar jack cheese - Have it as a bowl for a GF option! Served with a choice of fries or apple wedges, and milk or juice. Topped with a berry coulis. Two large chocolate chip cookies with Tahitian vanilla ice cream and whipped cream. Delectable dark chocolate cake, layered with silky rich chocolate caramel, wrapped in a chocolate truffle icing, and dusted with Oreo crumb. A rich and moist flourless chocolate cake. 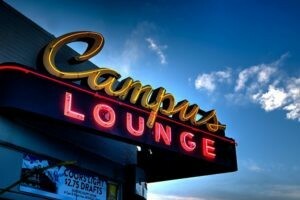 Campus Lounge has been a Denver icon for over 50 years in the Bonnie Brae Neighborhood. Recently reestablished by a Colorado Native father-son duo (and their close family friend), Campus Lounge is your home away from home. Whether you gather with your family, friends, neighbors or sports fans alike, you will enjoy good eats, cold drinks, and an atmosphere that feels like family. With 17 flat screen TV's, and a mega projector, never miss your favorite sports game. Gather your crew for a game of shuffle board, friendly Foosball competition, or PacMan on the original Campus Lounge machine. Looking for your own party? Campus Lounge has a private space with big screen projector. Plus the restaurant is fully equipped with high speed WiFi, so you can check on your Fantasy Teams all day and night. Whether you’re gathering to reminisce on old memories, or creating new ones for years to come, Campus Lounge is where the tradition lives on! Want to host a private event? Campus Lounge has the space for you. Enjoy our private room with seating for 35 people and space for up to 50. Use the big screen projector for a presentation, movie, slide show, or sports game. Fully equipped with WiFi, so you can hold your draft parties or club meetings with ease. We'd love to hear from you - send us a message and we will follow up as soon as we can!